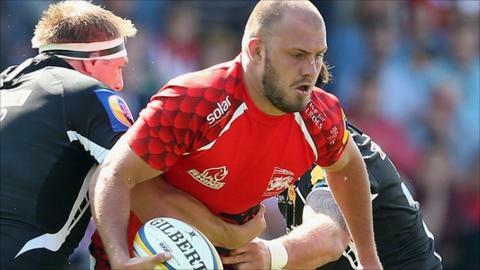 Australian Lachlan McCaffrey is relishing life at London Welsh despite their disappointing start to the Premiership season. They lost 52-0 to Exeter in their first game back in the top flight. The 24-year-old back-row forward joined the Exiles from Super 15 side the Brumbies over the summer. "The Premiership is an amazing competition and we've put a squad together that will hopefully compete in every game," he told BBC Oxford. "It's very exciting. Rugby is so big here and across Europe. At the age of 24, with a British passport I thought it would be a great opportunity to play against some great players in these famous stadiums and clubs." Welsh travel to Bath this weekend and the former Australia Under-20 player has backed his new side to bounce back from the heavy opening defeat. "Our forward pack has a huge amount of respect for the Bath pack," he said. "We'll have to step up and make sure we're defending a lot better than the weekend. "We didn't work hard enough in defence so as long as the energy is there a lot of the soft tries will be cancelled out. Hopefully some of our attack can finish off and put some pressure on Bath." "I'm sharing a flat with our big fat half-back Piri Weepu. He's a good bloke, we're both clean, things are going smoothly apart from missing rubbish collection day. I'm the best cook, Piri's living on takeaways"
McCaffrey began his career at Waratahs in 2010, but moved to Western Force before spending last season at Brumbies. Career highlights so far include his debut for Waratahs at the age of 20, facing the likes of All Blacks duo Richie McCaw and Kieran Read, and playing against the British and Irish Lions. "I could have stayed at the Brumbies but I wanted a change," he said. "I got in touch with Justin (Burnell), met him at the Singapore 10s and it went from there. "I got the most out of the Brumbies last year. I'm a bit older and we had a really special organisation and team there. It was a good platform for the Premiership." McCaffrey is now sharing a flat with World Cup-winning All Blacks scrum-half Piri Weepu, and he is enjoying his new life, even if he is acting as chef for the New Zealander. "The boys have been great, the coaching team, staff and whole club have been really welcoming and that makes it easy," he said. "You feel at home, I'm living down the road in Richmond which is a great area. I'm sharing a flat with our big fat half-back Piri Weepu. We're new to the area and have lots to learn and hopefully with some special memories. He's chilled out, I like chilled out. "He's a good bloke, we're both clean, things are going smoothly apart from missing rubbish collection day. I'm the best cook, Piri's living on takeaways."